This is to ensure that the process doesn’t hang in case the ssh client disconnects. 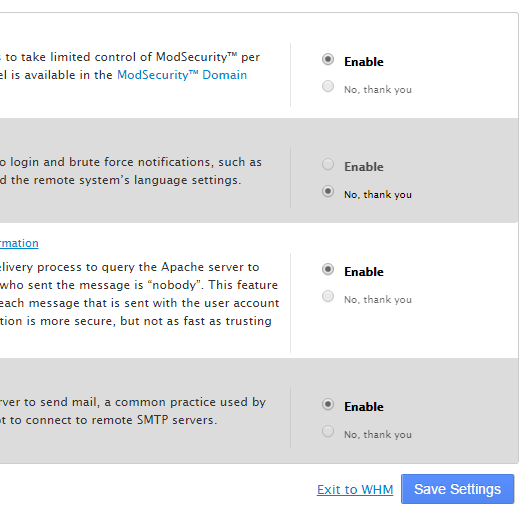 Install the latest stable version of WHM/cPanel. Login to https://$ip_address:2087/ to continue installation. 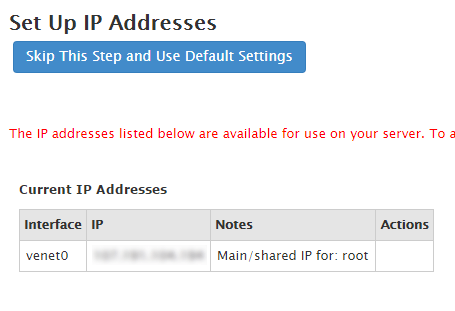 The variable $ip_address could either be an ip assigned by your host or a fully qualified domain name. 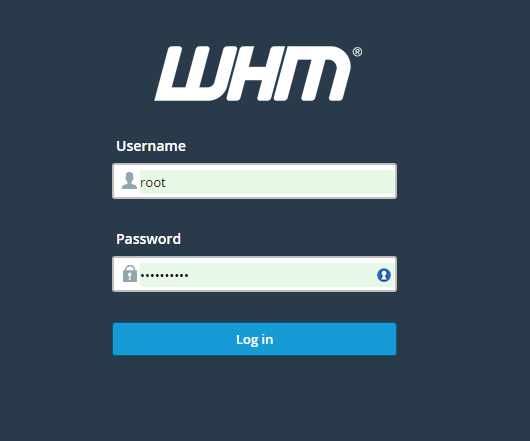 Login with the root credentials on the WHM control panel. Update contact information. Make sure this is a working email address. Configure the hostname. This should be a fully qualified domain (FQDN). 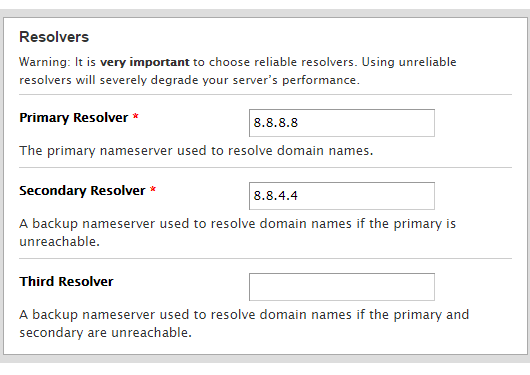 Fill in the ip addresses for domain resolvers. We use Google’s nameservers since they are pretty reliable and free. Configure ethernet device. 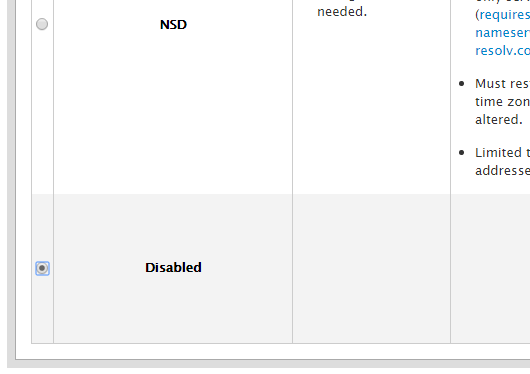 Common setup will only have one ethernet device. Save and proceed to the next step. 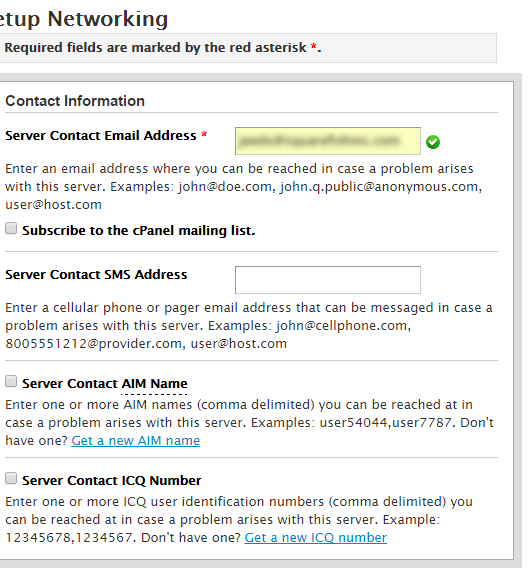 Setup the ip address, just click on Skip This Step and Use Default Settings. 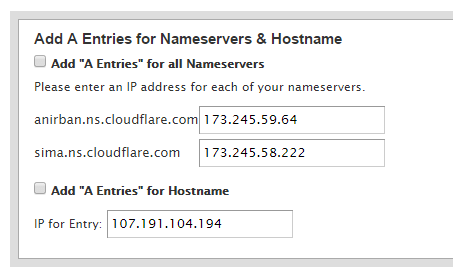 Since we’ve decided to use the cloudflare name servers, Name Server configuration is disabled. Add A entry is skipped. On the next window configure FTP, mail and cPHulk. 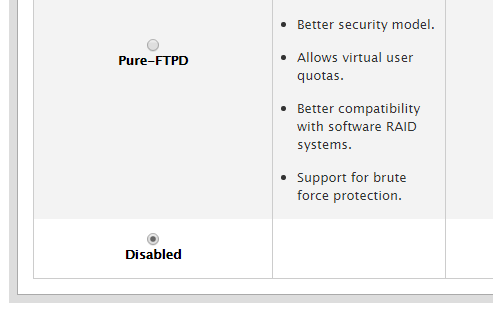 Disable FTP to force SFTP only. 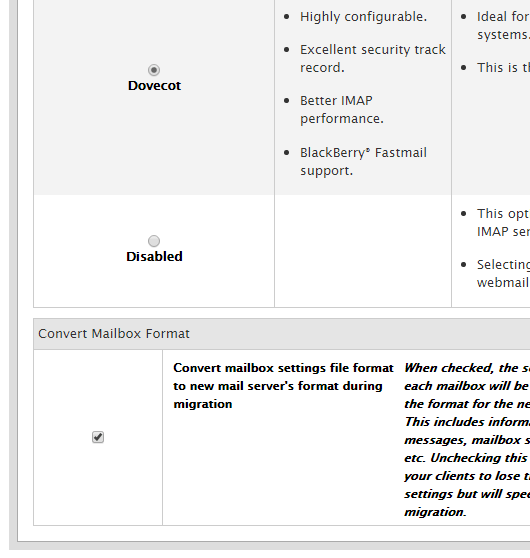 Use Dovecot as mail server. Enable cPHulk. 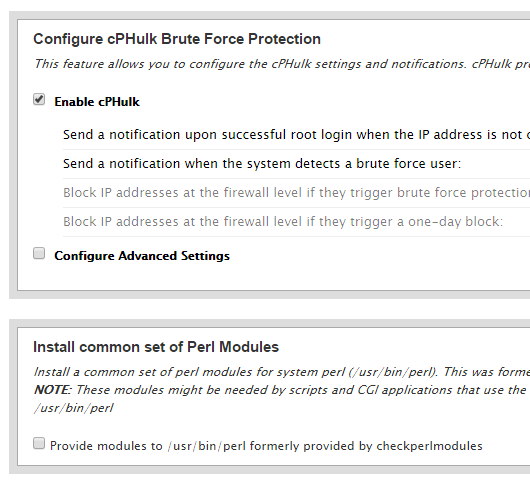 Uncheck Install common set of Perl Modules. Save and go to step 6. On the next window, use the default options. Use default options as well with the new features. 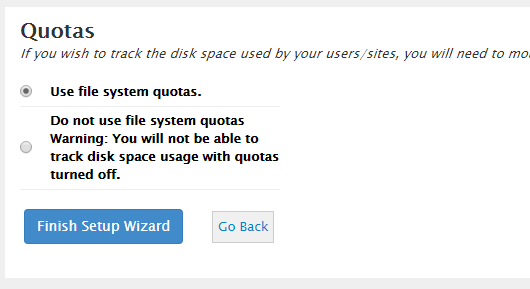 Once this is done, make sure to enable ionCube and ZenGuard on cPanel. 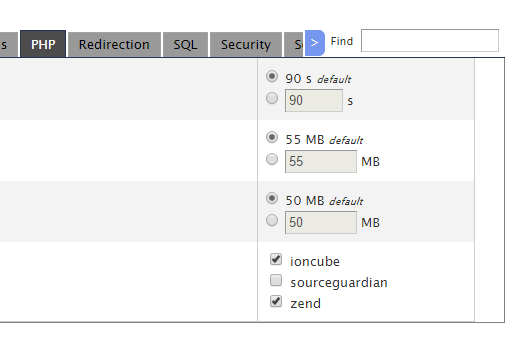 Go to Server Configuration > Tweak Settings > PHP. This install guide is for varnish version 3.x. Before installing varnish, change the port that Apache listens to, in this case 8080. It can be any other unused port. 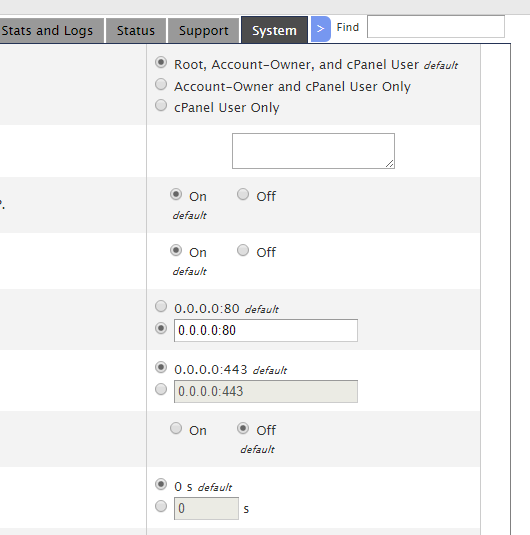 This can be accessed via Tweak Settings > System > Apache non-SSL IP/port. After install is complete, edit config file and change listening port to 80. This tells varnish to write the cache in memory instead of file and limit the size to 2GB. You’ll have to set the allocation smaller if you have limited memory. Create the varnish config file. Use the following configuration. Replace the $host_ip_address var to your host’s ip address. NOTE: if you use localhost or 127.0.0.1, varnish will fail to work. The site will show the default page instead of the correct content. Save config and start the varnish service. To view varnish stat issue this command. Give yourself a pat on the back. 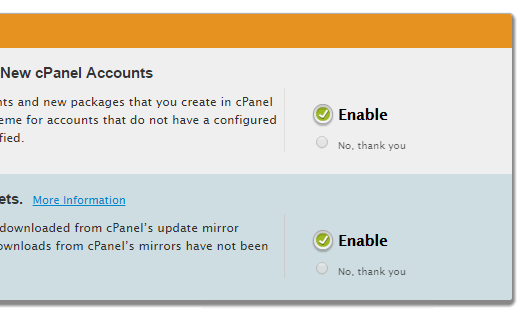 You can start adding accounts on cPanel.